That cake looked big enough for your family. We have made 4 upside down peach cakes so far for various occasions. They were all well received including at my office today. I may have let the peaches hung too long on the tree. They don’t last more than 2-3 days on the counter. This last picking, I have kept the best (unblemished) ones in the fridge. Hopefully, they will last a little longer. We plan to make another cake for this Sunday party at a friend’s house. Thanks again, Jolene, for sharing the recipe. The cake is impressive, but the penny whistle, mindblowing. My son is very clever pushing buttons on a keyboard. One of my Carnivals dropped and though it had some damage (2/3 of it was OK, but it looks like there was a worm, then wasps), it was very tasty. An all-time high brix (for a peach) of 23. In the 3 days since this post, I had another damaged one drop (21 brix) and today picked the last one. While fully ripe, it wasn’t overripe. It couldn’t match the 23 brix from the damaged one, but 17-19 brix is still plenty for me. The texture is firm, without excessive juice. Perfect to me, though I think my wife would have preferred it a bit juicier: “It’s good- sweet, but not very juicy…” was her comment. I only gave her a bit anyway- most of it was eaten by me and my older daughter who also liked it. So, while I am thrilled with Carnival, it looks like I need to find a later one to really stretch the season. It didn’t make it all the way until October. There is only 1 Heath Cling left on the tree as well, though some of the early drops were insect related. 7 of the next 10 days are forecast in the 70’s, so there is still plenty of season left for fruit to ripen (at least in some years). Very nice, Bob, to have peaches from your own tree into Oct. Your Carnival looked so clean internally. Many of my late picked AS rotted internally with no obvious cause, unfortunately. I think when White Heath is more mature and less infested it should bare for you into Oct. I’ve still got peaches in my tree, but the seasons split pit problem and the Feb deep freeze affected my crop a great deal and there are only a few peaches left on my tree. I expect most seasons it will perform much better. Only a few varieties were affected by that freeze, but the Messina right next to it also produced a light crop as well as the Indian Free nearby, although the Messina set well enough. More a matter of not needing to thin it. Location may have made the three more vulnerable- the flower buds must have been more swollen than other varieties in mid-Feb.
Nice forum - new to this. I am in northern CA, zone 9b (Sunset 14). A vote for Fairtime peach. My tree is four years old, in rather poor soil, and has grown very well and produced a good amount of fruit for two seasons now. This year the fruit were very large. The flesh is smooth, firm, lacking fibers, sweet and pleasant with a hint of astringency, very juicy. I also have August Pride, which is earlier and very similar in flavor/texture, however that tree hasn’t thrived too well. When does the Fairtime ripen? Just a couple of weeks ago. Early to mid-September. I said I would report on my late peaches. I picked the last few Halloween peaches on Monday. They stay very firm and hold a long time on the tree. I probably can keep them in good shape in the frig until Halloween, but October 16th isn’t bad for peach harvest. They are not that juicy but have a very good sweet peach flavor. Thumbs up! In your zone 10b the “late” peach is almost a very “early” peach. When do your peaches start to bloom again? We are in zone 9b, not 10. Peaches will bloom in late February or early March. My squirrels would finish off that tree in half an hour. 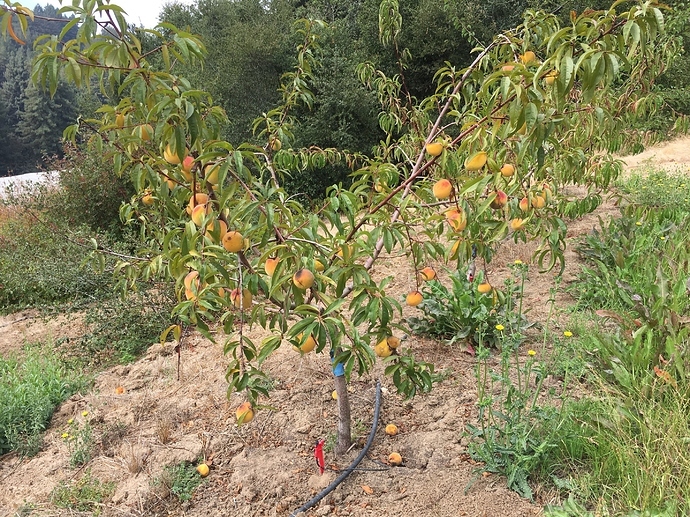 I planted a Flaming Fury " Fat Lady" peach this year. 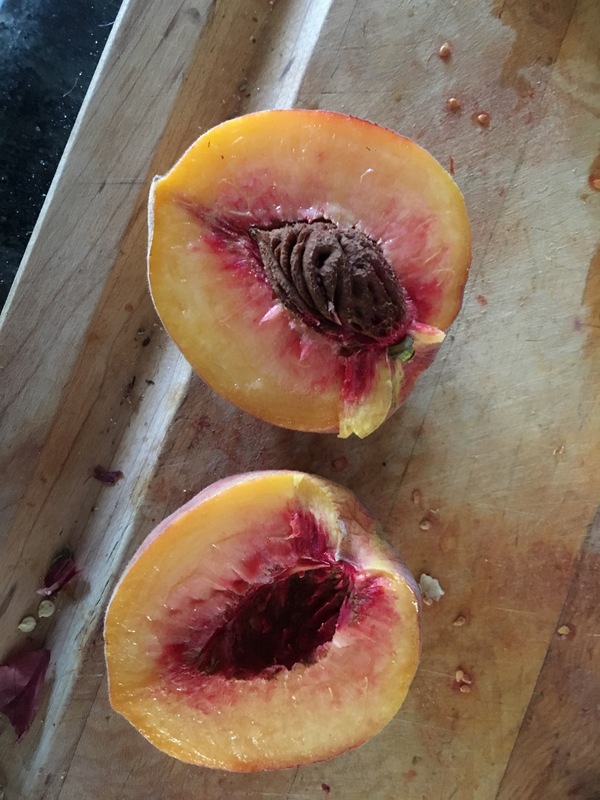 It ripens 41 days after my Redhaven peaches. The description sounded good plus I wanted a peach that was late in the season- for here 5B. I was afraid to get one much later than that. The weather hear gets kind of wonky at times. Our main goal at Paradise Farm is to collect as much data about growing fruit as we can. Just found out that the Freckle Face nectarine I just bought is on Nemaguard!!! I rwad up thread that it is somewhat tender for harsh winter. How are your peaches on nemaguard done so far. Should I keep this tree in pot or plant in ground? Our New England weather can be quite harsh. My area is back and forth between zone 6a and 5b. I haven’t ever had any peaches on Nemaguard. I have read Nemagard can be quite tender, so I might keep it protected in the Northeast, but that advice just comes from reading. I am inclined to keep it in pot since I read about its tenderness, too. My weather is not as harsh but I bought a peach on nemaguard by mistake. I took the advice in another thread, planted the graft union 2 inches below the ground and put about 8 inches of mulched leaves around the base during the winter. How your tree is doing this spring? It is true that your are at least a zone warmer, too. No issues so far for me. I meant to mulch it, but our coldest weather had passed before I remembered to add a few pine needles around the rootstock. So, White Heath Cling has survived it’s second winter (entering its 3rd year in the ground) without apparent issues. And the new Pumpkin Spice also seems to be leafing out (and even a few flowers) after fall planting and it’s first winter in the ground. As Alan pointed out a single example (or even 3 winter-trees survived) isn’t conclusive evidence. I’d like to hear other’s experiences, but it looks like anyone who paid enough attention to know what their rootstock is also was wise enough to not get nemagaurd in cold areas. But I’m not sure how much colder your winters are. I don’t even really know how cold it got here, as the new outdoor thermometer gave me a crazy reading (-18F), while Weather.com gave a low of -6F, on Jan 7th. That capped the coldest week of the year, with a -2F and several days with single digit lows. Other than that one week, it never got under 10F all winter. It’s also possible that the bigger issue than the absolute low could be fluctuating temperatures and it being slow to harden off. That would go a long way toward explaining places like Virginia, Georgia and Oklahoma (IIRC) finding it too tender. But, I think Spuddaddy has a good idea- plant it a bit deeper and let the cultivar itself root out.